« Genome sequences reduce the complexity of bacterial flagella. This may be old news, but it seems worthwhile responding anyway because hey, I have a blog now. In 2005, Ebach and Holdrege wrote a letter to Nature in which they repeated the common misconception that DNA barcoding steals funding from taxonomic research. I responded by pointing out that DNA barcoding has not drawn support from the taxonomy pool, but rather so far has competed with medicine and genomics for support, or has brought in funds from sources that have not traditionally supported taxonomy. Apparently John Wilkins of Evolving Thoughts was not buying it. I feel somewhat qualified to speak on this because I co-authored a Genome Canada grant with Paul Hebert that helped to fund the Canadian Barcode of Life Network. Needless to say, Genome Canada does not normally fund taxonomy. Other sources of support have been the Moore Foundation, the Sloan Foundation, the Canada Foundation for Innovation, NSERC, and various other government and industry sources — none of which has been taken from taxonomists (and in fact, a lot of it goes directly to taxonomists). The “barcoders versus taxonomists” dichotomy, which is taken as a given by Ebach and Holdrege and other opponents of barcoding, is false. DNA barcoding is a collaborative enterprise, requiring people with different expertise. Existing DNA barcoding networks involve a large number of professional taxonomists, and major participants include museums and other taxonomic institutions. It also is a gross caricature to suggest that those who come at the issue from a molecular perspective are not interested in organismal biology. Paul Hebert, considered the father of DNA barcoding, spent most of his career cataloguing the diversity and phylogeography of aquatic microcrustaceans. This included both morphological and molecular work and even extended to development of traditional taxonomic keys. Many of the rest of us are proponents of barcoding because it allows us to access information about organisms that otherwise is inaccessible to non-taxonomists. As far as I know, Wilkins is not a biologist, which means that his work is not contingent on being able to obtain species identifications. The situation is very different for biodiversity researchers. I have plenty of genome size estimates that remain unpublished because, try as I might, I cannot get them identified. Even assuming that a suitable taxonomic expert exists, he or she may be backlogged by a year or more. This is why DNA barcoding proponents consider it an enabling technology — a lot more scientists need taxonomy than do taxonomy. I personally don’t know any DNA barcoders who would disagree with this. DNA barcoding is not the endpoint of biodiversity research, it is an access point. It may help to identify “groups” of genetically similar organisms, but the description of those groups, if warranted, will be done according to traditional taxonomic principles. This would not even be an issue, and DNA barcoding could focus only on its primary objective of identification, if not for the fact that most of life has yet to be described. If anything, barcoding should make these new taxonomic descriptions both easier and more accessible, which is the reason that so many taxonomists are working as part of the DNA barcoding initiative. DNA barcoders are interested in information about biodiversity, and they want it to be accessible to everyone — and so far, they have worked to accomplish this without siphoning funds from the existing taxonomic pot. Ebach, M.C. and C. Holdrege. 2005. DNA barcoding is no substitute for taxonomy. Nature 434: 697. Gregory, T.R. 2005. DNA barcoding does not compete with taxonomy. Nature 434: 1067. Hebert, P.D.N. and T.R. Gregory. 2005. The promise of DNA barcoding for taxonomy. Systematic Biology 54: 852-859. Schindel, D.E. and S.E. Miller. 2005. DNA barcoding a useful tool for taxonomists. 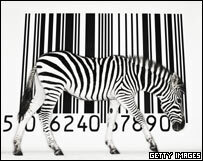 Nature 435: 17.
Who pays for DNA barcoding? CBC on the lack of funding for Genome Canada. 2 comments to DNA barcoding and taxonomy funding. Thanks for that response. I think that the issue is rife with misunderstandings (it’s a matter of methodology in taxonomy after all, right?). But I do worry that politicians will see barcoding as a substitute for alpha taxonomy. Certainly, that is the message that anti-barcoders have worked hard to establish, so I wouldn’t be surprised if that is the way it is interpreted.